A day after its political reporter was manhandled by the candidate’s campaign manager in front of witnesses, the Trump-friendly news outlet has offered only the mildest of rebukes. 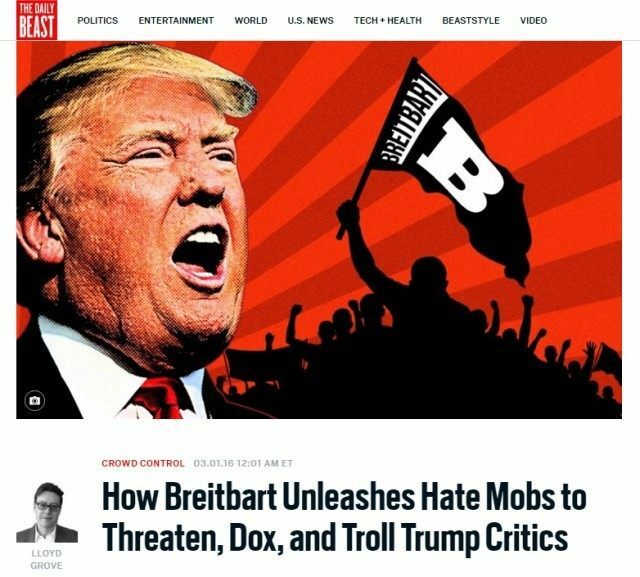 The reality television billionaire might also be laying the groundwork for a not-so-brave new world in which a campaign manager can assault a female journalist, while her news organization—in this case the famously Trump-friendly Breitbart News—responds with a mild rebuke in a vague statement perceived by some to be designed to protect the perpetrator. This apparently describes, at least according to witnesses and other journalists interviewed by The Daily Beast, Breitbart’s handling of an incident Tuesday nightinvolving Trump campaign manager Corey Lewandowski and Breitbart political reporter Michelle Fields. The statement was issued in the wee hours of Wednesday morning but remains Breitbart’s official comment on the matter, hours after sources said Lewandowski acknowledged to Breitbart’s Washington political editor, Matthew Boyle, that he did manhandle Fields. The Breitbart statement struck sources within Breitbart and outside the company as strangely inadequate, given that it blames an unidentified “someone,” uses the conditional phrase “if that’s the case,” and leaves open the possibility that Lewandowski didn’t lay hands on Fields.